Giant pharmaceutical companies have spent billions of dollars trying to crack Alzheimer’s disease, only to come up empty time after time. For small, cash-strapped biotechs, the challenge is even harder. Tufts University professor Philip Haydon is trying to make the improbable journey anyway. Haydon has created GliaCure, a tiny startup run out of his Boston condominium, to go after a target often overlooked in drug development: microglial cells, one of the family of cells that provide the “glue” to hold together the brain’s hard-working neurons. And he’s about to find out if he’s on to something. This week, GliaCure’s Alzheimer’s prospect, known by the name GC021109, began its first clinical trial. The drug candidate is the culmination of 20 years of work for Haydon, the chair of Tufts’ neuroscience department. Like any effort to treat Alzheimer’s, GliaCure’s quest is fraught with risk. Haydon is trying to do what has not worked so far in many large clinical trials: make Alzheimer’s patients better by clearing out the telltale plaques, or clumps of misfolded amyloid-beta protein, from their brains. After a first safety test in healthy volunteers, GliaCure will go after patients already showing serious signs of the disease, even though many in the field believe those patients are beyond help. Haydon hopes a new approach can produce results. He aims to use a small molecule drug to target a specific receptor on microglia, one of the types of glial cells that that serve at least two purposes. 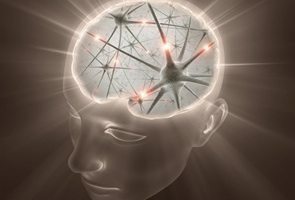 They are the “glue” in the brain that holds neurons in place and connects them to one another as they fire the electrical and chemical signals responsible for our actions and feelings. Microglia are also part of the brain’s specialized immune system. But when there’s inflammation in the brain, such as with Alzheimer’s, they don’t do a good job of clearing amyloid-beta plaques. Haydon believes his drug might not only stimulate the microglia’s natural plaque clearing ability, but also cool off the inflammation that might be getting in their way. “This two-pronged parallel action really sets us apart from what anyone else has tried,” says Haydon, GliaCure’s president, co-founder, and chief scientific officer. Scientists still have a lot to learn about what’s really going wrong in the underlying biology of Alzheimer’s, which strips people of their ability to reason and remember. Many still believe that amyloid-beta plaques are a key to the Alzheimer’s mystery, but clearing those plaques from the brain hasn’t made patients better. Adding to the mystery, roughly 30 percent of people who develop plaques never develop Alzheimer’s at all. The role of inflammation is also attracting more scrutiny, as it is in many diseases. Studies of non-steroidal anti-inflammatory drugs—aspirin, ibuprofen and the like—have uncovered a potential link between their use and lower Alzheimer’s risk, but there’s been no clinical proof. The only approved drugs on the market, donepezil (Aricept) and memantine (Namenda), are cognitive boosters that, at best, help delay the progression of the disease for some patients. Because of the scientific uncertainty, Alzheimer’s drugs are extremely expensive to test and difficult to reliably measure. It’s hard for a tiny biotech to take a drug from idea to the FDA finish line; it’s probably impossible in Alzheimer’s. GliaCure is going to need a lot of help from institutional investors and a partnership with a pharmaceutical company should GC021109 show potential in human patients. Outside of its three-member executive team, the company has one full-time employee, Haydon’s wife Yolande (GliaCure’s business manager). The office is Haydon’s condominium, which overlooks the Boston harbor. While some of the science takes place at Haydon’s lab at Tufts, GliaCure outsources as much as possible to CROs. Then there’s GliaCure’s approach. Haydon says for many years, people have targeted glial cells in drug development in “haphazard” fashion. That’s partly because our understanding of their roles is relatively new. Until the early 1990s, there was no method to study glial cells, even though they account for 90 percent of the brain’s volume.